Eagle perched on cactus with snake in beak. 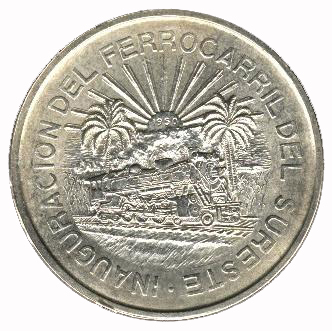 Rising sun with 1950 inscribed over train with two palm trees. Commemorates the opening of the Railway line running from Mexico City all the way to the Yucatan Peninsula up to Port Progreso at the very tip of the peninsula. 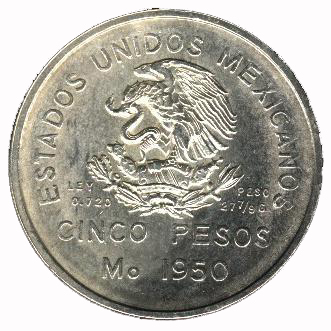 NOTE: Coin was badly distributed and most of them were stored in Mexico City Mint. Later when the time came to make other silver coins they were marked for re-melt; this destroyed over half of them, effectively making this one of the rarest mid-1900s silver coins in Mexico. 1950 Mo 200,000 17.94 22.07 100,000 melted.